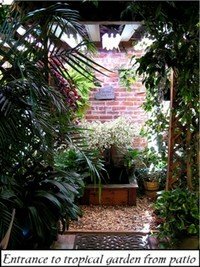 A Tropical Garden Adjacent to Your Bedroom: Why not?! My wife was somewhat skeptical-okay, actually aghast-when I approached her about my yen to build a tropical garden in the midst of three bedrooms on the second floor of our 108-year-old home. We already have three bedrooms, I reasoned, and there are only two of us, so we certainly don't need them all. Besides, there's a fourth room up there that's pretty much vacant. As a Zone 5 gardener smitten by tropical plants, this proposal made perfect sense to me. "This is absolutely absurd! 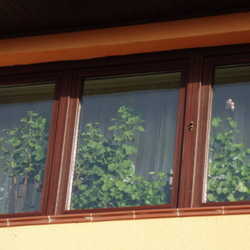 How are the plants going to survive up there without sunlight? You can't cram them all in front of the windows." "How are you going to get those big, heavy pots up there?" "Are you planning to have plants all over the room?" "Well, I need to have a place for my sewing machine and some additional storage space." "That's fine. I'll figure something out." As you may have surmised by now, my wife of 45 years is truly a saint. Having gained my wife's reluctant consent, I spent the next three weeks or so coming up with design ideas. I'm not very good at drawing up plans on paper, so I worked things out in my head. The time to do this, I discovered, was at night in bed before falling asleep. That's when the best ideas came to me. First, I worked out a space compromise with my wife. The vacant room measures 15 feet by 15 feet. 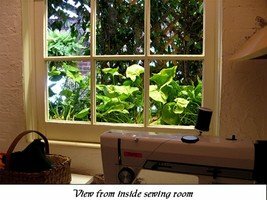 One third would be devoted strictly to plants, one third to a patio and a few more plants, and one third to a sewing room and storage. The plant and patio parts were easy. 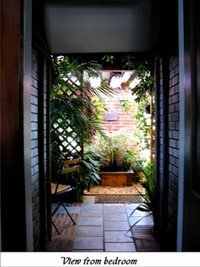 I partitioned off the garden third of the room from the patio third by installing a latticework wall with a doorway in the middle of the wall to provide access to the garden from the patio. On the patio side of the lattice, I built narrow "raised beds" filled with rocks and sand that would hold additional plants. 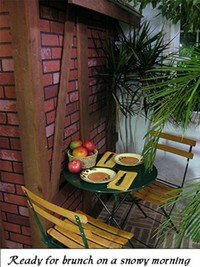 In the garden proper, I used the same rock-and-sand mixture. 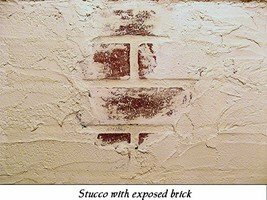 Before putting it down, I exposed the brick on an exterior wall (see photo at left) to give some added interest. 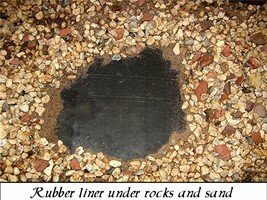 Then I sealed the wooden floor with roof sealer and covered that with 20-year rubber pond liner. The sand and rocks would provide a great deal of surface area from which water could evaporate to create a humid atmosphere. Pots could drip and leak to their heart's content, as the water was captured by the out-of-sight rubber barrier. 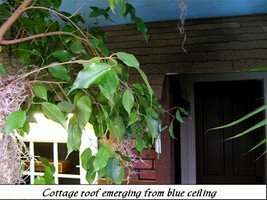 Next, I dropped the nine-foot ceiling down a foot and a half in the garden, so potted plants situated on the floor would receive adequate light. I installed a bank of 11 fluorescent light fixtures, using inexpensive "shop lights," and spaced them about a foot and a half apart. If you've ever checked out grow-light bulbs that purport to simulate the entire spectrum of sunshine, you know that they're very expensive. I solved that problem by purchasing both ordinary grow-light bulbs ("wide spectrum" Sylvania GrowLux), which represent primarily the warm spectrum, and "cool white" bulbs to cover the rest of the spectrum. Each fixture has one of each kind of bulb. An added bonus is the fact that the heat from the bulbs is sufficient to heat the entire room, no furnace or heater needed. The lights are on a timer, providing plants with 14 hours of daylight. As a final touch, I added a fountain with a small pool. A concealed pump lifts the water from the pool up to a small downward-slanting trough. I filled the trough with activated charcoal, using a few rocks from the floor to retain the charcoal particles. 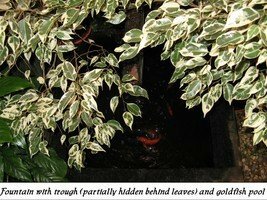 This arrangement serves both to purify and oxygenate the water as it trickles through the trough and splashes back into the pool below without the need for an expensive filtering system. I stocked the pool with the obligatory goldfish. 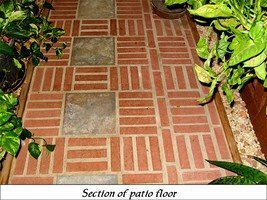 Mindful of the fact that I would be adding a great deal of weight to the floor, I chose brick veneer and ceramic tile for the patio surface and installed them right over the wooden floor. Veneer probably wouldn't have been necessary, given the huge oak and walnut beams used by my forebears when they constructed this house, but I wasn't taking any chances. I most definitely did not want to hear what my wife had to say if the entire garden came crashing down into our dining room! The real challenge was that last third of the room. 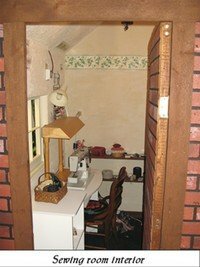 How on earth would I create a space for sewing and storage, especially one that was compatible with a garden? It was at this juncture that our outside gardens, and in particular the brick cottage located there, were to provide the necessary inspiration: Why not build a cottage? Given the limited space, I quickly came to the conclusion that I could only build a partial façade. To give the illusion of a complete structure, I built the roof so that it comes right out of the nine-foot ceiling where it meets the wall that separates the garden room from the master bedroom. The roof slopes down gently toward the patio to a six-foot height at the front of the façade. An entryway divides the cottage in half, with the door to our bedroom serving as the (faux) entry door to the cottage. I wanted to use actual brick for the cottage exterior, given that the real cottage is of brick and that I had exposed the brick on one wall of the garden. Again, visions of a tangle of plants, pots, and plaster on our dining room floor from the added weight dissuaded me from doing so. 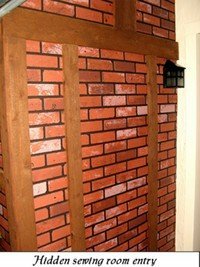 I settled for brick paneling, accented with rough cedar plank "half-timbering." The portion of the cottage on the left-hand side of the entryway became the sewing room and the portion on the right-hand side the storage room. 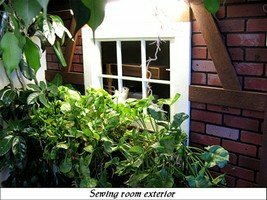 I added a window and a window box to the sewing room side, so that my wife could sit and sew while viewing the tranquil garden outside. 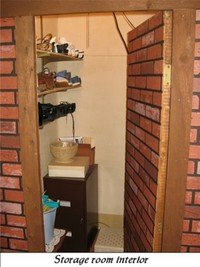 I finished the interior wall with the same brick paneling that I used for the outside, but covered it with stucco, exposing patches of brick here and there as I went. I covered the floor with a remnant of emerald green carpeting. Inside the storage half of the cottage, I installed shelves, created stucco walls, and painted the bare wooden floor. Perhaps you're wondering at this point how we get inside the cottage, since the entry door leads into the bedroom. 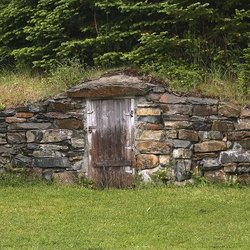 The side walls of the cottage entryway are actually doors into the two cottage halves. From the outside, there is really no way to tell that the doors are there, unless you push against them. I installed spring-loaded hinges, so that the doors would need no telltale handles, would simply push open, and would close on their own. As I conclude this article, it's dark out, there's a foot or so of snow and ice on the ground, topped off by temperatures in the single digits and winds howling at 40 miles per hour. 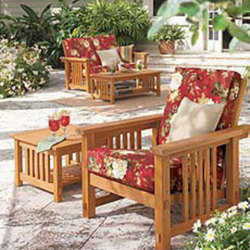 But in our tropical garden it's still daylight, the temperature is balmy, and the trade winds are calm. You'll have to excuse me now. It's time to go have a tall, cool one and catch some rays. Author's note: If there are any wild and crazy indoor gardeners like me out there who would actually consider building an exotic tropical garden under grow lights, I would be happy to give particulars and answer questions. If you already have one, hats off to you! Tell me about it. Your comments (even if you're not an indoor tropical gardener), questions, and shared stories are welcome in the space provided below. For more on "zone envy," which could, after all, be construed as my motivation for constructing this garden, please see a recent article by DG member Carrie Lamont. An enthusiastic gardener for over 50 years, my first plant was a potted Ponderosa Lemon tree ordered from a comic book ad at age 15. I still have it, and it’s still bearing lemons! My wife and I garden on 3/4 of an acre, both flowers and vegetables. Although our garden is private, it's listed with the Smithsonian Institution in its Archives of American Gardens and is on the National Register of Historic Places. We garden organically and no-till. Our vegetable garden contains a seed bank of vegetables brought to this country from Germany in the mid-1800s. For more info: http://davesgarden.com/community/blogs/m/LarryR/. Photos that appear in my articles without credit are my own.